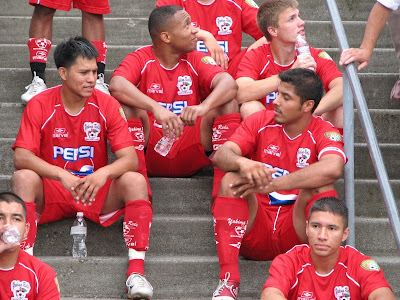 Reds sit on the stairs before a 2007 match in Tacoma. It is a sad day for soccer in the state of Washington and for fans of the Yakima Reds. Yakima Reds forced to call it quits after 14 years in the Yakima community - It is with great sadness that I have to write this email to inform you that the Yakima Reds will no longer be a part of the United Soccer Leagues or the Yakima Community. Irwin Research & Development, the owner of the Yakima Reds, has been greatly effected by the current economy, and does not have the finances to support the Yakima Reds in 2009. We have had some great sponsors who have supported us through the years, but the majority of the expenses were covered by Irwin Research & Development. We have tried to get backing from other business owners in our area, sending out letters asking for support, but just could not come up with the funding to commit for 2009 in the time that was needed. Fans of Tacoma Tide FC will be especially saddened by these developments. In three short seasons the Tide and Reds became strong rivals. The battles of Yellow v. Red never failed to produce exciting and often emotional soccer. The Reds came into the PDL just one season after the current Sounders came back to life in what is now the USL-1. For fourteen seasons the Reds brought soccer to the Valley and gave fans and players a chance to celebrate the beautiful game. Along the way players like Jake Sagare and 2008 League MVP Junior Garcia starred for Yakima. The Reds lived on after the Spokane Shadow folded in early 2006. Out of the death of the Shadow Tacoma FC quickly came to life and took over the Shadow's home dates out west. Tacoma FC and Yakima met for the first time on May 20, 2006. TFC got their first goal and first-ever point in a 1-1 draw with the Reds. The Reds and Tide played 8 matches against each other with Tacoma winning the derby 4-2-2. I remember vividly the last Tacoma home match of just a few months ago. The playoffs and the division were on the line as the Tide hosted the Reds. Up in the stands the traveling contingent from Yakima included the owner, player wives, relatives and other fans. Even though the visitors went home that night with a loss, they knew they had played in a 'big match' and the fans knew they had traveled well. Here's hoping that, much like the Shadow of Spokane eventually were brought back as the Spiders, Yakima sees soccer returning again as an oasis during its blazing summers.